Posted on July 20, 2018 by Matthew Leib. This entry was posted in Spotlight, Staff Stories and tagged Spotlight, staff story. Bookmark the permalink. On Friday afternoon, 36 high school students and their families will gather at Intellectual House for a graduation ceremony celebrating their completion of UW Nurse Camp—a program that lasts only five days, but which will likely alter the course of many their lives. Co-founded* in 2009 by Carolyn Chow, director of admissions and student diversity at the UW School of Nursing, the free-for-campers camp aims to open the possibilities of a career in nursing to rising sophomore and junior high school students who come from under-served and under-represented backgrounds. The concept grew from Chow’s desire to help more first-generation college-going students find a foothold in the nursing profession and, in the process, bring a greater sense of equity to both healthcare education and healthcare as a whole. “Because there are so few spaces in the Nursing program, diverse applicants were missing the cutoff in the admissions process and we were trying to figure out why that was,” Chow says, recounting how, a decade ago, she would see otherwise “incredible” candidates suffer in the application process because they were coming to UW underprepared for the rigorous prerequisite coursework necessary for success in the nursing program. “When campers look at the next generation, they will offer the same kind of support and encouragement,” Chow says. 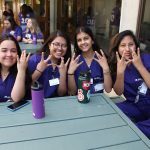 Over the past decade, UW Nurse Camp has grown from a program with five nursing student leaders mentoring 24 high school campers to one where 20+ nursing students support 34 campers. 98 percent of camp alumni have gone on to attend college. The program’s success can be attributed to its dualistic nature: where some might see it as an educational camp for high school students, they’d miss the program’s leadership-building potential for current nursing students. When former campers gain admission to UW School of Nursing, they return as camp leaders, gaining valued experience and connections that help them land jobs after they graduate. In addition to gaining their CPR certification, campers have the opportunity to shadow UW Medical Center nurses who donate their time and expertise to show campers how they take care of real patients and families. Campers also train in the School of Nursing’s Simulation Center equipped with the same technology as patient rooms at UWMC. On day four of camp, they participate in Speed Rounds, a networking event in which campers talk to professional nurses who work in a variety of healthcare settings, asking questions while also sharing and reflecting on their experience at camp to date before rotating to the next nurse every seven minutes. This year, six former campers graduated with a BSN from the UW—the most ever and a testament to the momentum Chow has managed to generate along with camp co-director Dina Dumas, Strategic Outreach Manager for Women and Children’s Services at UWMC. Chow underscores that building those intergenerational relationships is foundational not just for the future of UW School of Nursing, but also for the profession writ large. Campers train in the School of Nursing’s Simulation Center. But among those achievements, UW Nurse Camp stands apart. “This is one of the most proud accomplishments of my entire life—for real—just knowing myself and the people I’ve been working with over the past ten years have been able to seriously support students of color, people who are first in their family to go to college, people who are the first in their family to graduate high school, people who didn’t have the advantages I even had,” Chow says. A legacy of equitable education. At her core, she wanted to do graduate research on multicultural communication and—after coming out as gay—on communication and the social construction of identity. The only student of color in her cohort, Chow realized she could make a more profound impact in higher education with a new plan. After receiving her master’s, she worked for a year in the Department of Genome Sciences before landing a job at UW School of Nursing. This year marks her twentieth at the SoN and her tenth facilitating UW Nurse Camp, but it will also be her last. Later this year, she’ll move to Ithaca with her wife to support her as she battles follicular lymphoma. 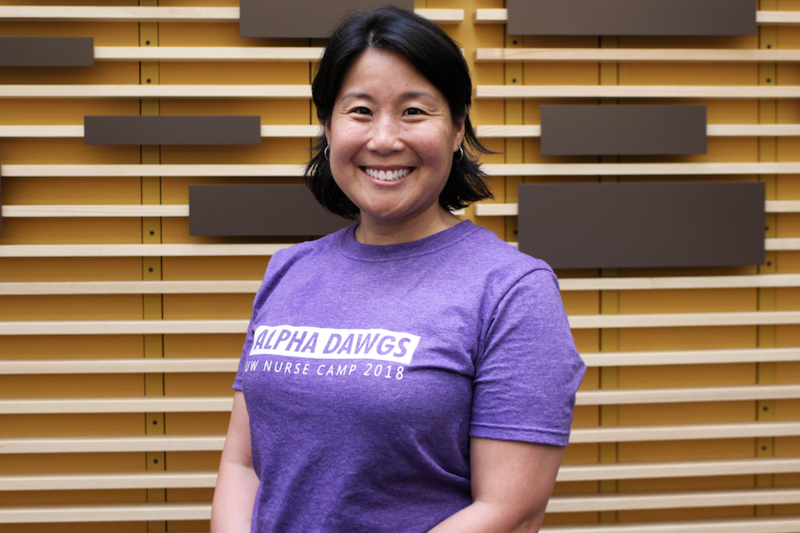 So what of UW Nurse Camp and the legacy she will leave behind? *Lauren Cline, formerly of UWMC, was the other co-founder, along with student founders Kimmy Chu, Steven Simpkins, Kelsey Rounds, Billierose Hair, and Hyacinth Barlow. UW Nurse Camp is run by the SoN Diversity Awareness Group (DAwGs), a registered student organization. They depend on contributions made by individuals, organizations, community groups and local restaurants. Fund a UW Nurse Camper: It takes about $250 per student for the entire week of UW Nurse Camp. This total includes a nutritious breakfast, lunch, snacks, and related supplies such as scrub tops, volunteer t-shirts, notebooks, pens, and bus tickets so campers can get to and from campus during the week. Through the generosity of contributors, we are able to keep this camp free of charge for participants. Please consider making a donation: a little goes a long way! All UW Nurse Camp donations are tax-deductible.